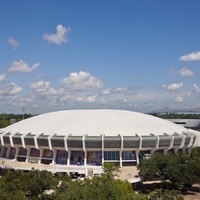 The PMAC, also known as the "Deaf Dome," can seat over 14,000 spectators.The center opened in 1971 and is named after the late "Pistol Pete" Maravich. This LSU basketball star played three seasons and currently holds the all-time career scoring record for the NCAA; he went on to play professionally. This building is one of the most versatile on campus, providing a sports arena, concert facilities, and an auditorium. LSU Commencement festivities begin with the main ceremony. Spring semester commencement festivities will continue.